Who can comprehend the love of God? His love for us is not based on our behavior or beauty. He loves us in spite of our sin. The message of His redeeming love is the heart and core of the gospel. The Creator God chose to reveal His loving heart through His prophet Hosea. The Creator God chose to reveal His loving heart through His prophet Hosea. Hosea had taken a wife of whoredoms. She left him and her children. Perhaps at one time, she was a beautiful woman, a woman whose company was desired by many people; but her life has been devastated by her sin. Sin always takes its terrible toll. There is pleasure in sin for a season, but the season is soon ended and nothing is left but death. Do you think the heart of Hosea was hurting? Why? Was it hurting from rejection? In one sense, love is the sum of all God’s attributes. Everything we attribute to God is summed up in His love. He loves us with an everlasting love. He suffers with us. He will not tolerate sin, but when we are hurting, He is hurting. Imagine Hosea arriving at a slave market. We know quite a bit about ancient slave markets because so much has been written about slavery. In the ancient world, someone could become a slave by one of three ways. Some people became slaves by conquest. After a battle was lost, the defeated people would be enslaved to the victors. Others became slaves by being born to a slave. A person could also become a slave by being indebted. Here is a woman who has spent all. She has nothing. What beauty she may have had is now vanished. What possessions she may have had are all gone. Even while she was in sin, her husband provided certain necessities for her. He later went to retrieve those things at God’s bidding. Remember, even while we are sinning, we are still enjoying God’s air and the health, strength, and freedom that God gives us. We are still enjoying so many of God’s blessings while we are running so far away from Him. Every time someone bids, someone else bids higher. There is a man in the crowd who is determined to pay whatever it costs to get her. We are told that fifteen pieces of silver is only half of what a slave would be worth. Evidently, she was so far gone that no one else would pay more. We will not love the Lord like we ought to love Him or serve the Lord like we ought to serve Him until we see ourselves standing on that auction block where Gomer stood. That is not just Hosea’s wife. That is you! That is me! We have been redeemed by the blood of the Lamb! The Devil is a liar. Everything he says is a lie. He even mixes some so-called “half-truths” with his lies, but it is all lies and deceit. He may tell you that he wants you, that you are needed and necessary. He may tell you that he will make you happy. But when he is finished with you, you will be left in nakedness to be sold to the highest bidder. The world looks on and decides you are not worth nearly what you might imagine. But another Bidder is standing there. He is Someone who cares and loves with an everlasting love. He pays the price for redemption. As a matter of fact, that word redeemed is a word that was used in the slave markets. It is a word that grows out of this experience and describes what was done for Gomer that day. That He did. He paid it all! When He saves you from sin and you recognize what it cost Him, you will have a love and devotion for Him. We love him because He first loved us. When I get weary in well doing, I think, “What is the cure?” The cure is Calvary. With a fresh glimpse of the Son of God, I remember myself on that auction block, and I recognize that He is the God who sought me. He is the God who suffers with me. He is the God who saved me! 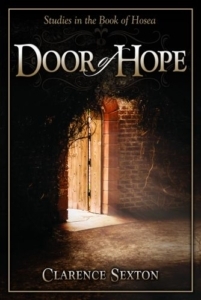 This post has been adapted from the full-length book, The Door of Hope.